A space system is a system of systems, consisting of many elements. It includes not only a launch vehicle and satellites but also ground segments such as the various ground facilities and installations. The mission success relies on the workings of the system as a whole, not on the discrete functions of its elements. In our research we will search for the most appropriate configuration of the elements in order to allocate a space system that will meet requirements for the system. We will study various concepts of the space system, together with scientific expertise and technological capabilities in cooperation with internal and external bodies. Based on this study, we will propose a project that can pave the way to technologies that enhance Japan’s competitiveness, provide solutions to societal challenges, and enable strategies to secure industrial growth in the decades to come. Recent shifts of emphasis in space programs bring new challenges to the design of a space system. The value of the system has been determined comprehensively, with inevitable trade-offs in factors such as performance, cost and user-friendliness. Our task now is to deliberate how the space system should be designed to meet the requirements. Without this approach, we could neither take full advantage of our key technologies nor create a space system capable of achieving the required missions. We develop and research space systems concepts, systems engineering techniques and innovative space systems architecture with a view to proposing an attractive, competitive space system for space development and utilization missions that provide remarkable benefits in the future. 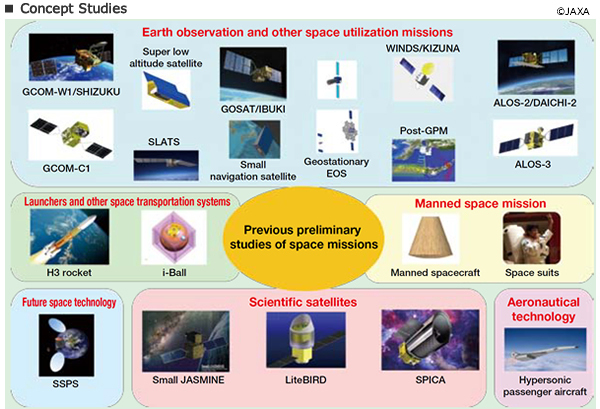 We build up an idea into desirable, feasible and viable plan and design space systems for future JAXA’s mission. So far we have been studying the following system concepts in accordance with the Basic Plan for Space Policy formulated by the Cabinet Office. We research and develop a process, methodology, tool and environment for efficient system concept studies and design of attractive space systems. We work together with experts in various technical fields to research and develop completely new concepts for space system architecture, including new configurations of the space and ground segments, integration, tests, and so on.